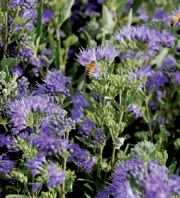 Caryopteris, also known as blue mist spiraea, is great for attracting butterflies and bees. Its numerous vivid blue flowers appear in late summer and early fall making it an excellent choice for an accent or contrast in flower beds. It is hardy, easy care and drought tolerant once established. There is a variety named ‘Dark Knight’ that has indigo blue blossoms that can grow larger than the blue mist variety—up to 3 to 4 feet tall by 4 to 6 feet wide.